Nanjing Youth Olympic Conference Center was built and put into use for the 2nd World Youth Olympic Games in 2014. It covers about 400,000m2 and is composed of a conference center of 6 stories, a five-star hotel of 68 stories and a meeting hotel of 58 stories, at the height of 46.9m, 314m and 249.5m respectively. The two towers are connected to the conference center via two corridors at 15m and 21.12m separately. 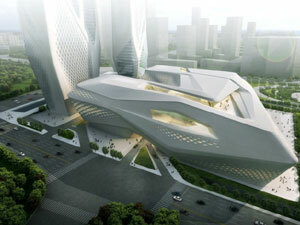 The project was designed by Zaha Hadid, a famous Architect in deconstructionism. Inspired by a sailing boat, she designed it like a space yacht, meaning that the Youth were setting out their voyage and riding the winds and waves bravely. A bird’s eye view of the building is really like a space yacht coming from an outer space due to its strong sculpture. However, one may have different images when viewing at different positions. Because of the irregular and complex construction structure, it was the most difficult project in the world, far beyond the difficulty for the Beijing 2008 Olympic Main Stadium --- Bird Nest. Most of the steel elements are connected in an inclined way and the total consumption of the elements reached 45,000 tons. All of the steel elements are in different shapes, sizes and weights. The conference center is cladded with more than 12700 different shape GRC panels, while for some area of the tower wall, there are more than 4000 pieces GRC panels. The project is made by complex steel structures, like a stool, whose four legs are independently constructed from the ground but gradually connected together between the locations in the height of 21m and 27m. Therefore, the perpendicular GRC elements are only used around the elevators. Such kind of “stool” structure avoids the pillars and guarantees the function and integrity of the whole building. When the design scheme and the building structure were finalized, the selection of wall cladding materials became the crux of the detailed design. In order to meet the requirements of the impression drawing and the tight project schedule, after a series of wall materials researching, the answer came out, the light weighted GRC panel was finally selected and used for Nanjing Youth Olympic Stadium due to its light weight, high strength, fast fabrication and easy installation as well as sound performance in displaying architectural appearance. Nanjing Beilida New Materials System Engineering Co., Ltd is a professional manufacturer of GRC wall panels in design, development and fabrication throughout the whole world. There is has an excellent design team for the company. 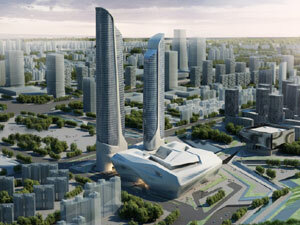 After the detailed discussions with the experts and designers of Zaha Hadid Architects, China Architecture Design Institute Co., Ltd and Shenzhen Hua Sen Curtain Wall Consultation Co., Ltd, it was decided that the walls of Conference Center and the Twin Towers (from the location of lower than 76 meters) would be cladded with irregular light GRC panels, approximately 110,000 m2 in total. It was an unprecedented application in the larger irregular building structure. The detailed design was mainly undertaken by our excellent designers. When receiving the building drawing and the Rhino 3D Model from Hua Sen Design Institute, our designers immediately carried out the relevant design works including installation scheme, panel division and shape design, secondary structure design, joints and brackets position design, product steel structures design, panel design and mechanical calculation. In order to express the appearance and culture connotation desired by the Architect, making samples was the most important at the beginning. On one hand, there was no real confirmed sample that the Architect can refer to, therefore, the tests and adjustments should be conducted successively by referring the requirements of the Architect and project leaders of Nanjing City; on the other hand, the color and texture of the samples should be in line with that of the real GRC products and within the limitations. Therefore, the sample maker should thoroughly understand the requirements of the Architect and the owner, so that he/she can get a better understanding of the appearance. Only based on these can a sample be made to express the desired appearance and realize the design intention. Because of the complex building profiles, checked by BIM model the multiple structure conflicts and connections were found many during the detailed design. In order to fully express the building sprit and integrity, the GRC panels were designed and classified into four types which were 40,000m2 of flat panels, with the normal size is 3mx2m and the maximum is 6m x 3m; 32,000m2 of folded panels, the normal size is (2+2)m x 2m and the maximum is (5+2)m x 3m; 30,000m2 of double curved panels, the normal size is 3m x 2m and the maximum is 6m x 4m; 8,000m2 of single curved panels, the normal size is 3m x 2m and the maximum is 6m x 4m. The panels were designed to be installed in an inclined line both for roof and walls, while the exact space for the installation of window glasses must be reserved. Considering the durability and mechanical safety, the panel thickness was finally designed at 15mm in accordance with the mechanical calculation during the profile design. The weight of the GRC panel is controlled at about 50kg/m2, including the weight of product support steel structure. 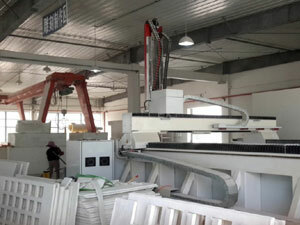 Such kind of GRC panels are really very thin but of high strength. GRC products are characterized by good advantages of light weight, high strength and sound fabrication performance. All of the raw materials and fabrication processes are in line with the high requirements of the international and European industrial standards. 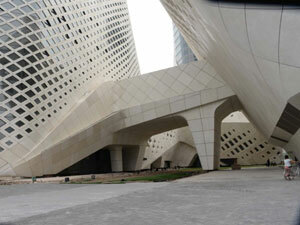 Thailand Elephant white cement is used in the production, its whiteness is higher than 90% and the strength is 42.5. All the aggregates during the production are composed of the good quartz sand with the content of SiO2 larger than 96%. The glass fibers are alkali resistant with the content of ZrO2 is higher than 16%. For the durability and good mechanical strength, some good additives bought from Rohm and Haas, BASF and Sika and Cem-fil are also used in the fabrication. All of the raw materials used in the production are in line with Precast Concrete Institute (PCI) GFRC recommendation specifications. After a series of tests, it is decided that the cement sand ratio is 1:1, water cement ratio is 0.38 and the fiber content is 5%. Due to these reasons, the products not only can express the designed sculpture and color but also meet the good product indexes detailed in the European industry specifications. In line with the Chinese standard, only the good steel rectangular pipes are used for the fabrication of product steel structure. The structure is welded in accordance with the welding specification and later on hot-dip galvanized by more than 70um, delivering a good performance of anti-corrosion for at least 50 years. Installation of steel supports (same as the secondary joist/structure mentioned above) In order to connect GRC steel structure with the building main structure, steel supports should be installed, which were designed by the GRC supplier by referring the drawings of the building main structure. The roof steel supports were composed of truss purlin and brackets, which were made and installed to the roof main truss by the installation company in accordance with the design drawings. The steel supports between every floor were designed in a box profile at a certain length and welded to the building main steel structure. Firstly, the purlin system of the roof steel supports was installed as per drawings. Secondly, the larger GRC panels were lifted and installed either from ridge and cornice down to the ground or in a reverse order. Later on, the main connectors of the panels and purlin system were fixed by referring the orthostichies. Finally the panel position adjustment and gap adjustment were done by taking advantage of particular gauges. Water chutes were installed at the back side. The steel supports and the building main structure were welded first by considering the precise installation positions. Later on, the products were lifted and fixed at the exact installation positions. When the installation work finished at a certain area, the position adjustment was carried out to guarantee an even gap between products. The surface protection of GRC panels has been the key concern of GRC experts. By applying the protection, not only the waterproof function and self clearance function can be provided, but also product color and matt granular texture can be maintained in a long period. Based on a series of experiments and careful considerations, an advanced inorganic hybrid silicone-acrylate emulsion was finally selected for protecting GRC panels. 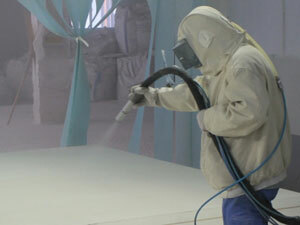 During its curing process, an inorganic volatility will release inorganic chemical compound which will migrate to and form a coating on the surface of the panel. The protective agents are characterized by good hydrophobic ability and resistance against photo catalyst corrosion. The application of light weight GRC wall panels in Nanjing Youth Olympic Conference Center, the first large-scale application for the modern stadiums, signifies that China is a leading country in concept innovation, technological development and engineering application. With the development of individuality and digitalization in building designs, by the application to Nanjing Youth Olympic Conference Center, the light weight GRC wall panels will definitely make greater contributions to the building design development just as what is demonstrated from this project. We believe that the GRC panels, featured with good functions, intelligence and environmental protection, will play a more important role in 21 Century constructions.